The North America paints and coatings market is expected to grow at a steady CAGR and positive investment opportunities. 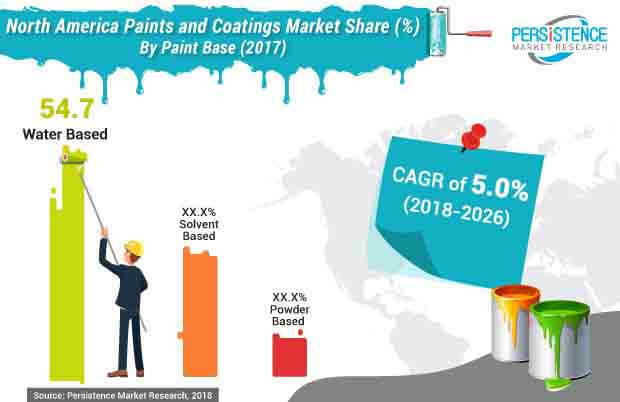 Persistence Market Research (PMR) analyzes the paints & coatings market to identify dynamics in the market and provide insights affecting various segments of the North America paints & coatings market. The report starts with the market overview and provides market definition and taxonomy along with value chain, pricing analysis country wise, drivers, restraints, and trends in the market- to provide better understanding of the market for the forecast period 2018-2026. In the next section- to understand and assess market opportunities and trends, the North America paints & coatings market has been segmented into categories like–paint base, application, end users, resin and region. All the market segments evaluate the North America paints and coatings market on the basis of various factors affecting the market. Each section discusses the qualitative and quantitative aspects of the market and also gives an estimate about the revenue opportunities for each segment over the forecast period. In the final section of the report, a detailed competition landscape with company market share and performance is provided, to provide audiences with a comprehensive view of key players operating in the North America paints & coatings market along with their business strategies to strengthen their presence. This would help in assessing strategies deployed by market leaders and define subsequent effective strategies accordingly. For market data analysis, we have considered 2017 as the base year, with market numbers estimated for 2018 and forecast made for 2018–2026. To calculate the market size, the report considers the weighted average price of industrial and decorative, based on paint based across key geographies on a country basis. The forecast assesses the total revenue (US$ Mn) as well as volume (KT) of the North America paints & coatings market. To deduce market volume size, consumption of paints & coatings has been considered. In order to provide an accurate forecast, we have started by sizing up the current market, which forms the basis of how the North America paints & coatings market is expected to develop in the future. The critical market data, including the base number and segment splits, has been devised through in-depth secondary research. This data is then triangulated on the basis of different verticals, considering both supply side and demand side drivers and other dynamics of the various regional markets, along with primary interviews of manufacturers and industry experts operating in the North America paints & coatings market. The forecast presented in the report evaluates the actual consumption of paints & coatings and expected consumption in the North America paints & coatings market over the forecast period. We have also analyzed the different segments of the North America paints & coatings market in terms of basis point share (BPS) to understand individual segments’ relative contribution to market growth. This detailed level of information is important for identifying the various key trends governing the North America paints & coatings market. The report also analyses the North America paints & coatings market based on the absolute dollar opportunity. This usually overlooked while estimating the market forecast. However, from a sales perspective, it is essential to identify absolute dollar opportunity is essential to identify potential resources in the paints & coatings market. PMR has developed a market attractiveness index to understand the key segments in terms of their performance and growth in the North America paints & coatings market. This market attractiveness index would help clients to identify real market opportunities in the North America paints & coatings market. The primary and the secondary research played a crucial part in gauging the evolving market behavior within the forecast period. The market for paints & coatings is dependent on the total production of the paints & coatings across the North America, moreover the paints & coatings has its own qualities that makes it popular amongst the consumers present in the North America market. Rising demand for paints & coatings is estimated to play a pivotal role in the North America market. The consumers in U.S. is very particular towards the use of paints & coatings. Every firm has a quality department to check the quality of the final finish product of the paints & coatings so that the procured products are up to the mark while in real time operation. Whether it is for interior painting a house or heavy-duty finishing manufactured goods such as cars, paints and coatings play a cardinal role in decorating and protecting. Additionally, the paints and coatings market continues to be in demand as it gives longevity to the finished goods and also act as a barrier against environmental conditions. The construction industry is not only a direct customer for paints and coatings, but also a key reflector of the economic health of a country, thus making its impact on the overall market to be crucial. North America including US and Canada, has witnessed an increase in residential, commercial, and infrastructural construction in recent times which led elevated sales of paints and coatings- giving an extra boost to the North America paints and coatings market. According to in-depth analysis, North America paints and coatings market is expected to hold approximately one fifth share, in terms of value and volume, in the global market- expanding a CAGR of 5% during the forecast period 2018-2026. Healthy economic conditions will create more investment opportunities in North America paints and coatings market in near future. According to Paint Quality Institute, a paint advising and testing organization, more than 80% household paints sold are water-based paints. Consumers and key players are increasingly attracted towards water-based products as it has fewer odors. Stringent environment compliances in the North America paints and coatings market is another reason for settling with water-based over solvent-based paints. Workers poorly ventilated spaces are exposed to dangerous evaporation from solvent-based paints and coatings. For this reason, many projects like working in fuel storage and railroad tanks make use of water-based coatings. It also reduces the concentration of flammable materials. Strict regulations and restrictions by state and local governments often set a threshold on how much VOC can a business emit. Though efforts are aligned towards the development of water-borne coatings, however, it is interesting to note that the share of water borne vs. solvent borne coatings differs significantly between the decorative and industrial coatings in the North America paints and coatings market. While the large share of decorative coatings are water based, the use of solvents is still prevalent in industrial coatings in a substantial amount. Key players in the North America paints and coatings market are focusing on adopting alternative distribution channels, such as the online channel, to further solidify their market presence in regional as well as in global markets. According to analysis, the North America paints and coating market is moving towards consolidation which has led to the pricing pressure among, tightening the profit margin scope for manufacturers. Majority of the key players are focusing on acquisition of small players and small-scale companies must make significant investments in R&D to introduce new products and enhance their presence across the globe.